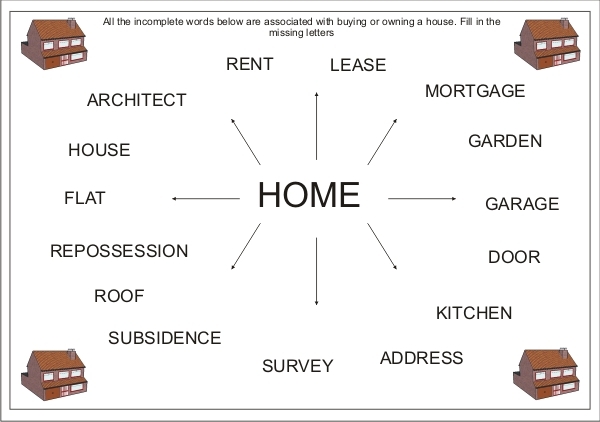 The lessons starter below is to help pupils/students focus on key words relating to houses/flats/accommodation. Pupils complete the words by filling in the missing letters and write a sentence explaining each of the words. The pupils should complete the sheet in five minutes. RENT: Rent is a fee paid by tenants for living in a property. Tenants are the people staying in a house/flat who do not own it but pay rent to the owner. Rent is normally paid monthly. LEASE: Instead of paying weekly or monthly rent a building can be leased. This means that the occupants pay to stay in the house for a period of time - normally a year or more. This is a contract for the period of time. 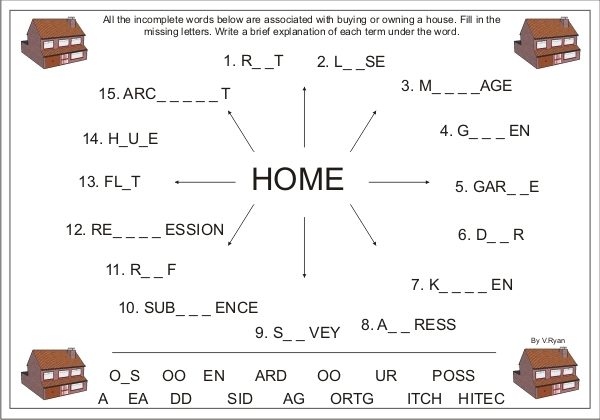 HOUSE: A house is usually semi-detached or detached. A house is comprised of bedrooms, a kitchen, living/dining room and also at least one bathroom. FLAT: A flat is accommodation within a building. The building may have a number of flats that are rented to individuals or families. A flat usually has less space than a house. REPOSSESSION: When people cannot pay the mortgage on their house it may be repossessed (taken off them) by the bank or building society that lent them the money to buy it. ROOF: The top part of a house. Normally composed of slates or tiles. It keeps water out of the house. SUBSIDENCE: Subsidence can occur when the land underneath a house collapses or becomes weakened. The walls may develop cracks and can even collapse due to subsidence. Subsidence can be extremely damaging to a building. SURVEY: A survey is normally carried out by a professional engineer. He/she evaluates the physical condition of a building and identifies faults and areas where maintenance is required. ADDRESS: This is the exact location of a house, flat or building. The address is normally composed of a street number, street name, town name and post code. KITCHEN: Used for the preparation of meals. DOOR: Opens and shuts allowing occupants into and out of a building or room. GARAGE: Houses a car or is sometimes used for storage. Some garages are converted into extra rooms. GARDEN: Contains flowers and a lawn. Usually at the front or back of a house. MORTGAGE: A loan from a bank or building society, usually for the purchase of a house, business or other type of accommodation.